It has been forever since I’ve added to my Fifty Shades of Grey collection! 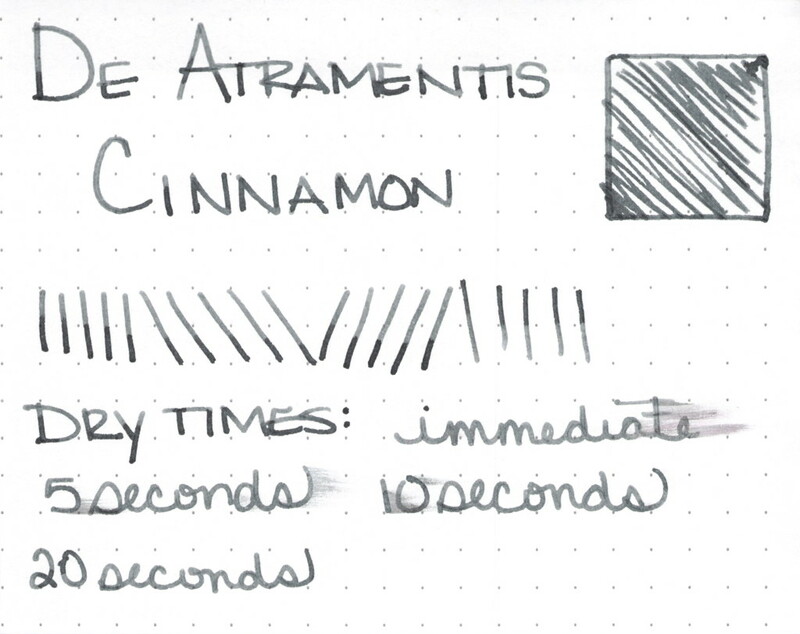 De Atramentis Cinnamon is from the scented line of De Atramentis inks for fountain pens. The scent is definitely cinnamon with no stinky undertones that I could detect. The ink is dark grey (or is it gray?) with a maybe a hint of green. I don’t see as much green in it as a I saw in De Atramentis Cement, and so I don’t think they are De Atramentis Twins, but they are definitely close, with Cinnamon being just a touch lighter. The ink writes wonderfully. No hard starts, no feathering, show-through, or bleeding on either Clairefontaine or Rhodia paper. Cinnamon won’t replace Pilot Iroshizuku Fuyu-syogun as my favorite gray ink, but I do like it quite a bit and find myself picking up the pen inked with it regularly. 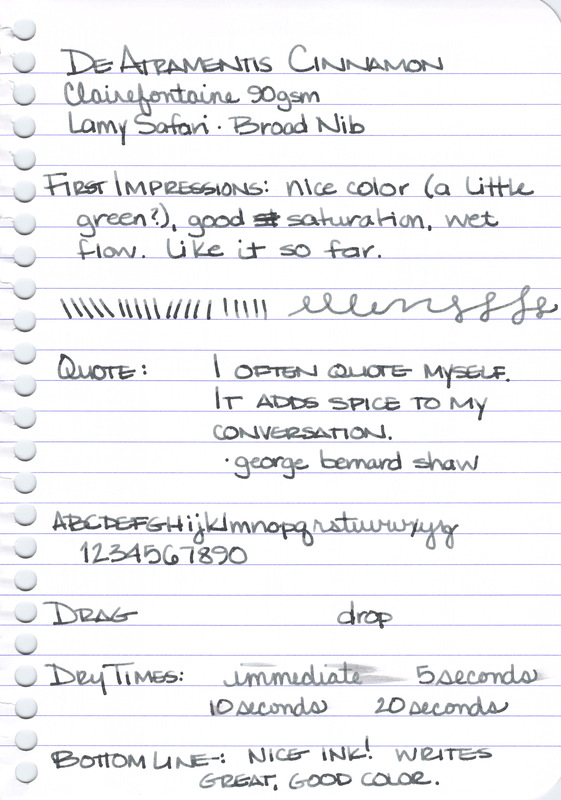 I scanned the handwritten review before I remembered to complete the water test – oops. Having later completed the test, you will have to trust me when I say that it behaved wonderfully. Not perfectly, but definitely better than what I expected. My bottom line is that this is an ink that many people will like. The color is good and the writing experience really couldn’t be better. Winner, winner! Have you tried this one? What is your favorite gray? Or do you spell it grey? Have you seen the movie Fifty Shades of Grey? Or read the book? This entry was posted in INKS and tagged de atramentis, fifty shades of grey, gray, grey, ink review by Christine (Pentulant). Bookmark the permalink.